AUCTIONS CLOSE SUNDAY 24th MARCH - DON’T MISS THEM! 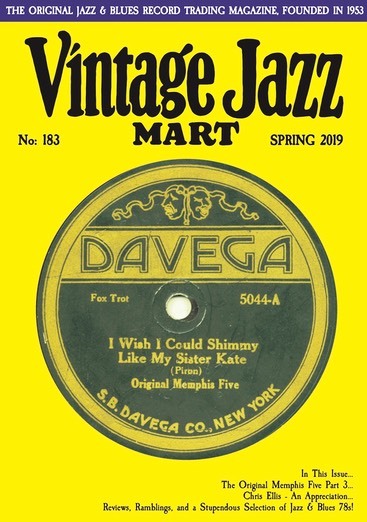 Vintage Jazz Mart is now available to buy as a readable online and downloadable edition, with all the content of the ‘hard copy’ but in colour and with clickable links to advertisers and auctions. Price is just £5 per issue or even less if you take out a 3-issue online subscription! As a bonus, from issue 181 onwards back numbers will be free! CLICK HERE to check the preview and to buy. Want to see a sample copy? Got the the Subscribe page and follow the instructions how to get a copy sent to you. Welcome to the Spring 2019 update of VJM’s website! Trevor Benwell started Vintage Jazz Mart in 1953, which makes us the oldest continually-published jazz and blues magazine in the world! The latest issue of Vintage Jazz Mart has the concluding part of Ralph Wondraschek’s mammoth history of the Original Memphis Five - a ‘ground up’ research project based entirely on contemporary sources. We’ve reproduced the article in full here, complete with additional material not originally published in the magazine. As you’ll see on our Auction link page we’ve another bumper offering of mouthwatering Jazz and Blues 78s including items from some legendary collections! Amazingly, there are even more in the hard copy and online editions of VJM - not all the auction listings are available on the VJM website - to see the others you’ll have to subscribe to the magazine - it’s great value and you can get your subscription HERE. Our proven track record of problem-free transactions forged over 60 years, together with unbeatable value advertising rates (that’s a fact - no fat cat shareholders or dotcom billionaires to pay dividends to here!) means we regularly offer the finest selection of records to be found anywhere. We've all the regular features, including our legendary CD and Book reviews, Ate van Delden's 'Discographical Ramblings' page and other articles not available here - you really don't know what you're missing if you don't subscribe. The world’s leading Jazz and Blues 78 and LP collectors subscribe to VJM - ask them why!